Wohoo! Hey friends! I’m back from my summer internet break ..and I brought pizza! To me, pizza and summer goes hand in hand. In our area of Sweden there are a couple of really rad pizza spots in the middle of nowhere who serves the most epic creations, and summers simply aren’t complete without at least 1 …2, 3, 4 visits. To smell the fiery oven in action, get into the delicious leisurely feeling of the whole place (with two mini’s, haha) and explore the surrounding gardens. Simple sunny luxury at it’s best. With a toddler who’s getting more and more into the ’I don’t like that’-phase the experiments of sneaking in more veggies in his meals quickly turned into something really ’effing good. 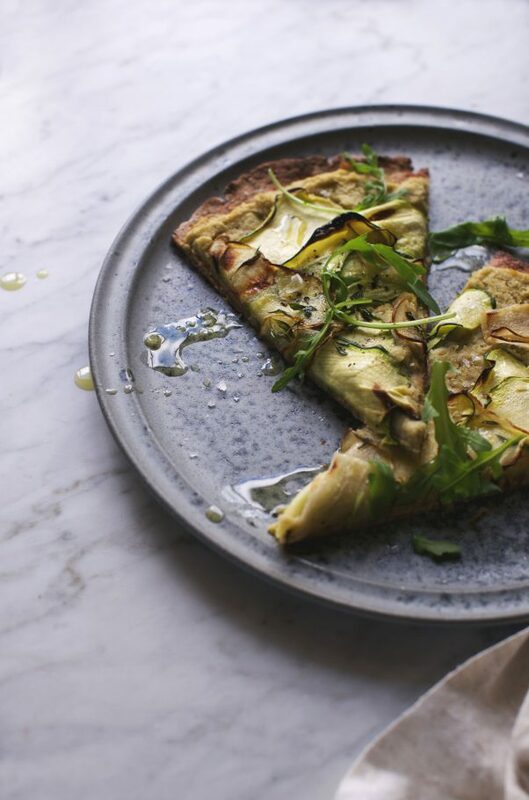 I was inspired by the feeling of both ease and ’special occasion’ that serving pizza has to it as I begun developing this Sneaky Veggie Pizza Blanco (I’ll get into the component specifics in the Fun & Fabulous Facts below). There have been A LOT of tweaking (it’s PIZZA we’re dealing with after all) and I’ll tell you, no complaining whatsoever have been heard. When I nailed the recipe a couple of weeks back – just in time to let all the late summer produce show off it’s #plantsaresexy on top of it – I did some internal YEAH’s as Caspian gobbled down piece after piece. (Internal because I didn’t want him to start second-guessing the epic pizza situation). So roll up your sleeves and throw some flour into the air. We’ll end peak summer with a bang. 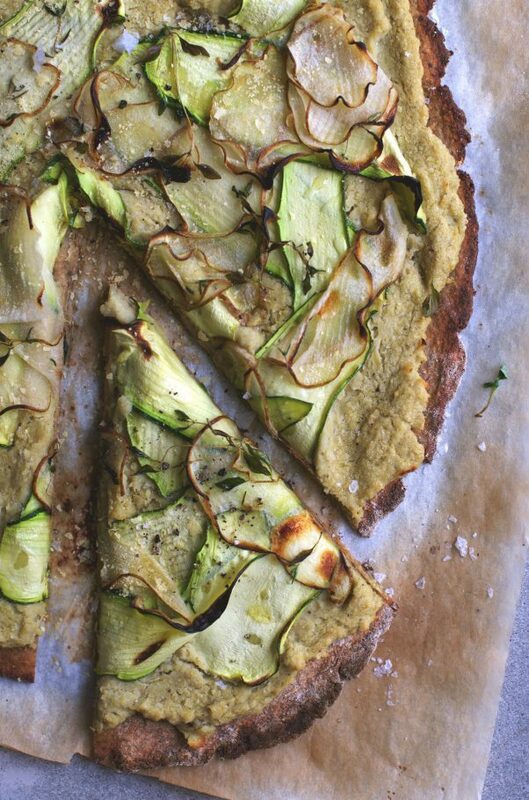 – What’s with the vegetable pizza bases? If you haven’t heard about, seen or tried any sneaky vegetable pizza bases these last years, chances are you’re either living under a rock or deep in the Himalayas. As health consciousness expands so does the use of vegetables and especially the use of vegetables in comfort classics, like pizza. I’ve done the whole ’only cauliflower pizza’ but to me, those 80% cauliflower pizza bases aren’t pizza bases anymore. They are more like yellowy limp pancakes piled with pizza fixings. When I make pizza I want to be able to eat it slice by slice without worrying about it breaking or crumbling. In my mind, pizza shouldn’t require cutlery or delicate mooves. It’s meant to be a little rough and tough. A slice it up and stuff your face kinda meal. This is why, when deciding to create a pizza base that made Caspian eat more vegetables I knew I needed to get it very right. It has a whole head of cauliflower, yes. 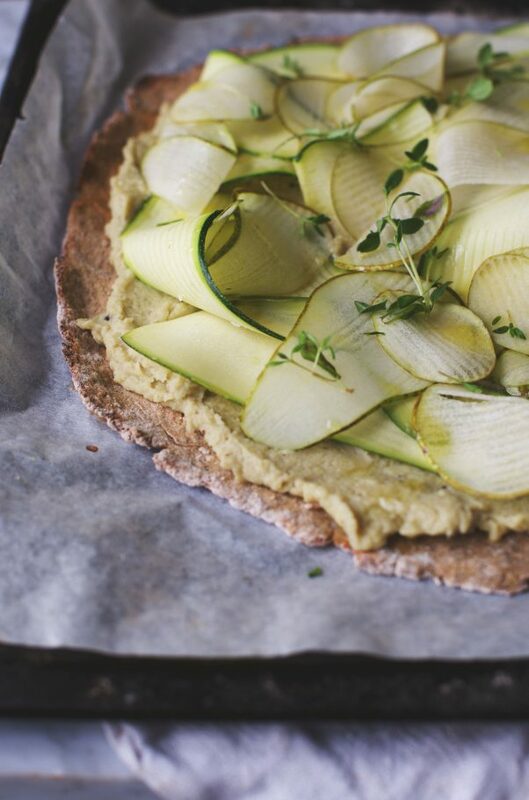 But it also relies on buckwheat flour/rice flour and brilliant flavorings to turn it into a base that is crisp, slices up easily, fully tastes like bread and can hold any and all toppings you like. So to sum things up this is a pizza base with all the qualities we want but with the health benefits of the extra nutrients and fiber from the cauliflower. While I’m so not one to shy away from a really awesome ’real’ pizza every now and then, It’s neat to have a recipe at hand that checks off the requirements of even being a weekly guest in our kitchen. 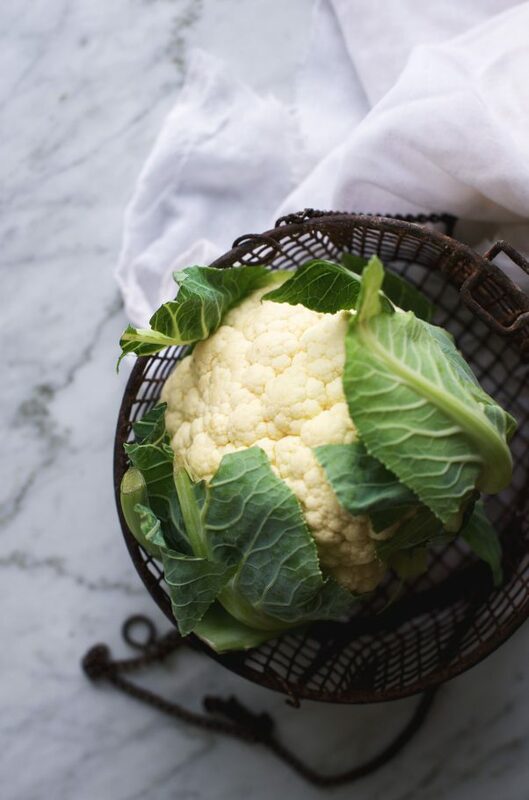 Base is partially made with cauliflower to add fiber and nutrients. The result fully tastes like bread and slices up without a hitch. The nutritional yeast adds both a rich cheesy flavor and great vitamins + minerals, don’t skip it. I like to prepare two heads of cauliflower while I’m at it and put one of the mixed, all liquid removed-ones in the freezer. Pizza night = easy breezy. 50/50 rice- & buckwheat flour is my favorite as the rice flour adds some crunch and the buckwheat is all around awesome taste and health-wise. An all buckwheat-base is less crisp and all rice-base is less flavorful. Feel free to explore! 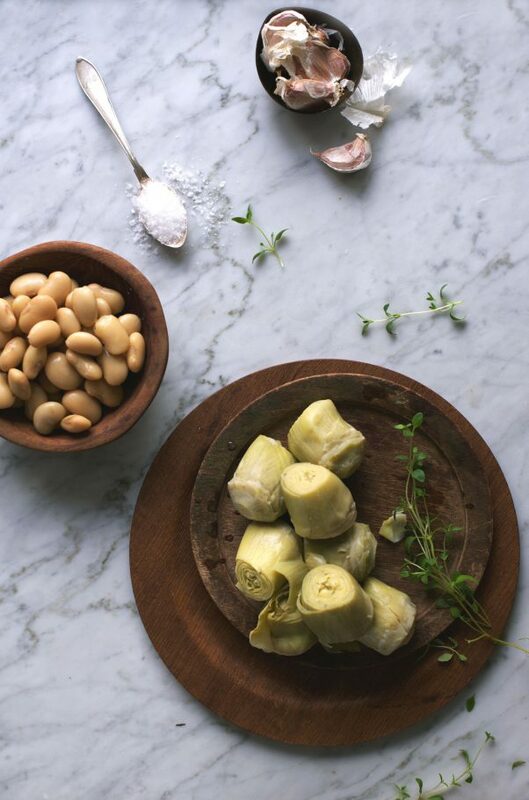 The artichoke cream has a boost of white beans to make just a few slices be more filling (and delish!). You might end up with leftover cream depending on how much you like to add to the pizza. Use it as a hummus/spread/dip. If you want to go for the classic tomato sauce instead I can tell you that it’s just as perfect. Serves 2 adults and one kiddo. For 3 adults and possible bonus of leftovers, make two bases. Stir together the chia seeds and the 4 tbsp of water. Let sit and swell while preparing the cauliflower. 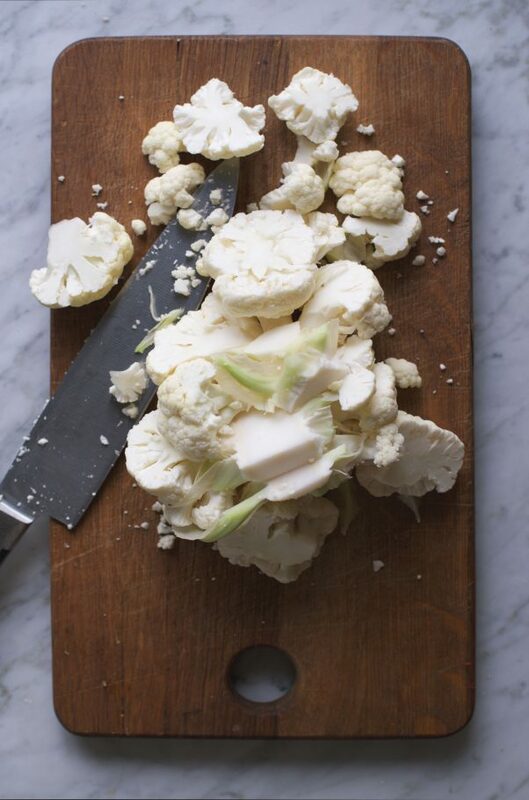 Remove greens from cauliflower (save for soups/stews!) and cut/break the head into medium pieces. Rinse and add pieces to a food processor. Blend into a fine flour-like mix. 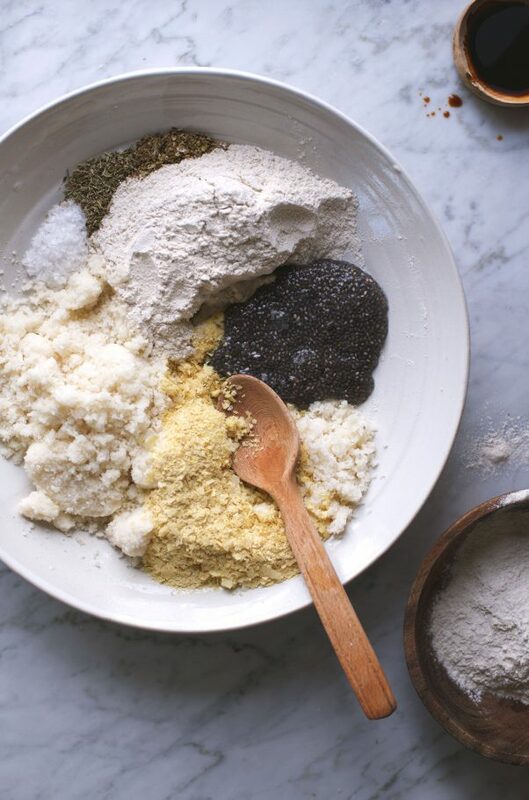 Now add the cauliflower flour to a large bowl with the rest of the ingredients, including chia mixture. Mix and work into a ball. 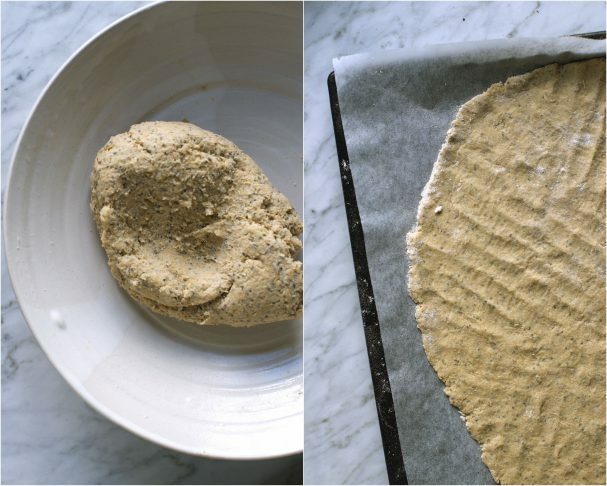 If the dough isn’t coming together at all you’ve probably used a very small cauliflower. Just add 1/2-1 tbsp water. Line a baking sheet, sprinkle with some flour and press dough into a large round, dip your fingers into flour every now and then for best result. The base is tastiest when it’s so thin it almost covers the entire pan. Bake in the middle of the oven for 12 minutes, remove and flip base over to the other side. Bake for an additional 4-5 minutes. Remove base from oven and add artichoke cream (I usually have 1/4-1/3 cup leftover). Arrange thin slices of pear and zucchini on top of the cream, finish off with some fresh thyme and bake for 5 minutes under the burner. Remove, drizzle with a little bit of honey for extra yum and enjoy! 1/2 heaping cup white beans, from a can is fine! Rinse beans and artichokes. Add all ingredients to a bowl and blend with a hand blender. Done! Note that you might end up with leftover cream depending on how much you like to add to the pizza. Use it as a hummus/spread/dip. I am truly grateful and so darn happy that you are here. Like for real. Just so you know. Now go make pizza!